On Wednesday night, I woke up at 11:30 pm wondering how I dozed off a few hours earlier. I didn’t have that tough of a day and my run went well. Then, it suddenly hit me: my run was in windchills dropping below 20C again; the fresh air knocked me right out. This past week has been the toughest week of running that I think I’ve ever had running. In Ontario, we had four straight days of temperatures dropping close to -30C with the windchill. 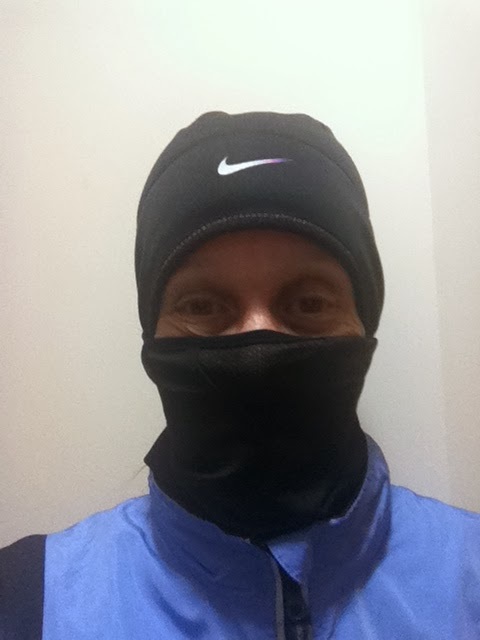 On Monday, I swapped my run with my Tuesday’s bike workout, hoping that it would warm up a bit. When it didn’t, I cringed. Tuesday, I planned to hit the rec centre and mill about. I thought about it all day long and, after school, I waited to head over – as late as I could in the hope that I could have the treadmill for an hour as it would be quieter then. At the last minute, though, I started to dress for the winter: 4 top layers, tights and a looser fitting pant over top, hat, two-layered mitts and my trusty balaclava. Even though it was 8:30 and the temperature was at -25c, I was heading outside. Snot freezes really fast! Yuck! My balaclava is what made the cold bearable. I started with it over my nose and mouth and uncovered my nose after a few minutes. Within the first mile, both of my nose and mouth were exposed, but I immediately recovered them when I had to stop at the traffic light. This routine – both, one and none – of covering and uncovering through my 8 miles let me breathe properly without worrying about my asthma kicking in. 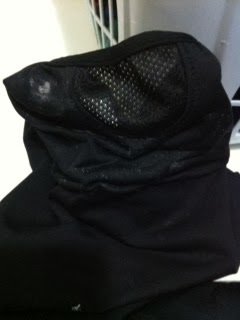 My only problem was dealing with the wet mucous that froze and melted everytime my balaclava changed positions. By mile 6, it was so frozen that I couldn’t stretch it back over my mouth so I had to rotate the entire piece and ran home with a frozen lump of snot next to my ear instead. Yuck! After getting through that hour, the rest of the week was much easier. Wednesday was equally cold but I had the company of TOC-Oakville to get me through the tempo. On Thursday, temperatures rose dramatically so that my evening run seemed almost balmy in comparison. And now, at the end of another snowstorm, I can smile because I got today’s workout out of the way before the snow started and I am looking forward to running with friends early tomorrow morning. Clothing, timing, friends: that’s what got me through this cold week of running. What did you do to get you through yours?